The Propagation of Electromagnetic Waves in Multiconductor Transmission Lines presents the study of the problems relating to the propagation of electromagnetic waves along multi-conductor transmission line. 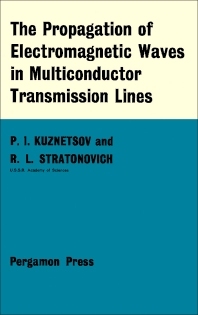 This book examines the theoretical investigations into the propagation of electromagnetic waves in transmission line systems involving two or more conductors. Organized into 12 chapters, this book begins with an overview of the rigorous method based on Maxwell's equations for solving the basic problem in the theory of the steady-state propagation of electromagnetic waves in a multi-conductor system. This text then examines the significant practical problem of determining the electromagnetic fields of symmetrical and non-symmetrical two-wire lines in free space. Other chapters consider the methods of calculating the parameters of non-uniform lines. This book discusses as well the problem of transient electromagnetic processes in a multi-conductor system. The final chapter deals with the asymptotic representation of cylindrical functions of two-imaginary variables. Electrical engineers will find this book useful.